What Are Your Job Interview Questions? Home / What’s New / What Are Your Job Interview Questions? That’s right! While job seekers are busy doing mock interviews, they should also be prepared to ask the prospective employer questions. Candidates often get so focused on what kind of enquiries they will face during an interview that they sometimes forget these meetings are also a time to learn more about their next workplace. Without question, interviews can be stressful, especially when they’re for a job you really want. However, you might find out it’s not your ideal workplace after all by asking some key questions of your own. While the company is determining if you’re the right fit, it’s important that you do the same for yourself. They may well be as impressed by your questions as your responses to what they’ve asked you. Even asking what the timeline for the vacant position will help you gauge what your own next steps will be for pursuing this and other opportunities. Staff at The Work Place in Grande Prairie can guide eligible unemployed or underemployed clients (visit www.gpworkplace.ca for details) on what questions you should ask during interviews and how to prepare for those that you may be asked. They can also assist you with your job search tools and ensure you’re using all the resources available to you, including accessing potential training opportunities (see contact details below). Your strategies may include updating or acquiring new skills. We have included two links below. The first provides a great list of question for candidates to pose during the interview. The second provides insight on how you can prepare for some common interview questions. 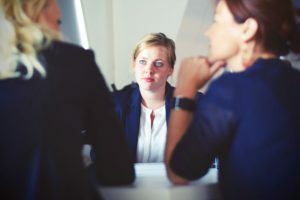 Ultimately, success in job interviews comes down to preparation, including doing your research on the company and, where possible, the people on the panel. If you’re an internal candidate, don’t assume everyone knows you and what you can do. Attend the interview well rested, groomed and ready for a great discussion about how this position fits into your career plans. And remember, now that you have made it to the interview process, you’ve already outshone many competitors. If you want more help with your job search at no cost, contact us at 780-539-5477. You can send enquiries to info@gpworkplace.ca. Our office is located at #105, 9840-97th Ave., Grande Prairie. We also help employers find qualified candidates.